Tom i’ver been thinking through my head.. I know i’m not going home.. I know Liza has done a lot of talking.. I know Emmett, Alec, and Topaz feels threaten by Liza. Tom says that Emmett and Jillian were trying to keep Gary on the block last week and it was Liza that convinced Tom to get Gary off the block. Tom: “Alec and Emmett felt very threatened by words not action” Tom says when he made the deal with Gary last week Emmett, Jillian and Alec were very mad at him. Tom says Topaz hasn’t talked to him since he’s been on the block. He points out that Topaz doesn’t do anything but sleep. Tom claims that Liza would never backdoor him, he thinks the more dangerous players in the house are Aj, Andrew and Topaz those are the floaters that will put him up. Tom wants the POV used to save Liza and they can put up one of the “Useless Players” Tom says Gary will get more mileage out of his HOH by teaming up with Liza and Tom. Tom says the only people that want Liza out are Emmett, Alec and Topaz. gary says it’s everyone in the house. Tom doesn’t think so calls Liza a “beautiful Sweetheart” (LOL OMG that is funny) Gary says once Liza went up on the block everything all her stories become revealed because people were talking. Tom says it was only Alec, Topaz and Emmett. gary says no it was the entire house. Gary says that he won the HOH so he could do what he wants to do but now that Alec has POV Gary can’t do it now. Tom says he’s going to try and get Alec to use the POV on him he just needs Gary to put up Andrew or AJ. Tom asks him if he feels having Liza and Tom nominated right.. Does he feel it in his gut? Tom says that himself, Peter, Suzette and Talla will vote for Liza to stay if she’s if she’s up against AJ. 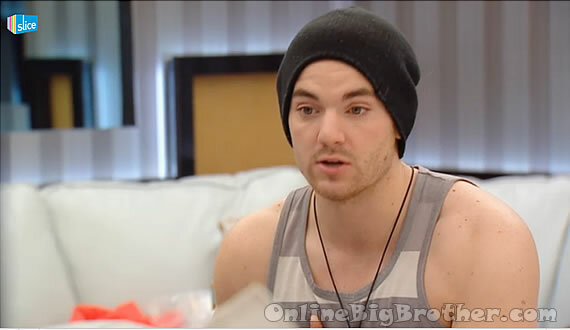 Tom is going to try an “Bro Talk” to Alec to get him to use the Power of Veto and save him. Tom warns Gary about Alec says he’s talking with Fear personal fear. Tom says for him to make sure he talks to Alec not Social Psychologist Alec. 12:00AM Hammock Gary and Jillian Gary and Jillian apologize for what happened early with the pedicures. Jillian freaked out about having to do the pedicures and Gary got pissed about it. Gary didn’t know exactly what they had to do until he read the rules and was like “B1tch this is involved.. you haven’t eaten.. you have your period. Gary says everyone is talking to him even people that have never before. There’s a lot of sh!t being told to him. Gary says that Tom is really been working him to get Alec to use the Veto but Gary doesn’t have the Veto and Alec is his own person. Gary threatens if Alec uses POV he’ll put Peter up as the replacement nominee. Emmett says how dangerous saying thing like that is on this show, People are going to base their opinions of him on that. Gary says Tom wants Alec to use the Veto on Him so that him and Liza and screw over Alec and Emmett. Alec: “He already talked to me and I told him look man it’s not going to happen. Gary confirms that he wants Tom gone this week.. They starts to talk about their final 4 and how messing things can become. (Alec, Topaz, PEter and Gary) Apparently Emmett is their number 5. Tom calls Emmett a big baby he’s in Big Brother he needs to stop crying about protein powder. Talla agrees. Tom keeps on about Emmett complaining about the protein power. “Be a man.. what would you do with survival.. what would you do if you are on a deserted island” Talla calls the the other players an embarrassment. Talla is getting steamed. Tom to talla: “I love you heart and your passion.. but you can’t say anything until you get HOH” Tom tells them when he wins HOH he’s putting Topaz and Gary up. 1:38AM HOH Topaz and Gary Gary is going over his conversation with Tom. Pretty much the same thing we’ve heard before. Gary is getting really pissed at Talla. Gary wants Tom, Liza then Talla gone. Gary calls Talla a “Jumper” because she jumps ship when things get rough. Topaz is worried about Andrew, Gary thought that Alec is good with Andrew. Topaz needs to start talking to him tomorrow. Gary calls Jillian 2 face, “She literally rubbed Tom’s back minutes before she was telling me she wants him up” Topaz agrees. Everyone does know everything in the house….I wish Gary would just keep all the info he received to himself….that would benefit him so much later in the game. Peter is right….They all know Gary has all this intel about who said what, who likes who, who is targeting who….houseguests are going to know Gary spilled the beans and will be scared what he has said to others so he is going to be a huge target….especially since its a live double eviction and he can’t play in the HOH. I’m trying to figure out who would not nominate him (other than Topaz and maybe Alec). I think the biggest problem with the quatra is that alec, emmitt and peter try to save each other and if someone wants them to get them out they try to devert it alec did with andrew about emmit and peter tried to get emmitt and jill off his raidar. While tom seems only concerned about himself. Tom discussing game with Talla and AJ reminds me of the scene in Rudolph the Red-nosed Reindeer when Rudolph, that dentist elf, and the great Yukon Cornelius travel to the Land of Misfit Toys. “Nobody wants to play with a Charlie-in-the-Box.” Tom’s talking game to two Charlie-in-the-Boxes. It is funny how in one breath tom is telling gary that emmitt is his boy and in the next he is throwing him under the bus while emmitt feels bad for tom being on the block somehow i am being to think emmitt will do better without tom in the house. I can’t believe tom is still defending liza to emmitt of all people and wants alec to take him off (then he will try a swing the votes off of liza). Tom has said that liza is his no mance but he seems to be defending that relationship more then alec or immitt. I do not think tom is loyal to them and will do more damage then liza can. First I must say that it is good to hear that the foul language in the house has decreased tremendously. Thumbs hup to the producers for curbing it. And also for Emmitts mom in hi us HOH letter calling him on it. Secondly I laugh at Tom trying so hard to save Liza. He will regret it on Thursday if he is evicted. Should have spent more time on himself. Liza a sweet girl?? Lol…too funny. The reason she doesn’t like Emmitt is because she can’t control him like the others in the house. He doesn’t stroke her ego like the others do. I hope Alec doesn’t use the POV but if he does then Gary should put up Topaz as punishment even if she would be a pawn. This week is going to drive me completely crazy listening to Tom and Liza complain and whine about being on the block. They are such hypocrites!! Tom can dish it but he defiantly can’t take it. And same goes for Liza. I loved Liza in the beginning but she came on way to strong and talked way too much about people to the wrong people. When you become too confident you lose in this game.. Unless your will or boogie. As far as I’m concerned her and Tom deserve each other. Tom was so worried in the earlier weeks about the “bros” letting the showmances wreck their games but the only person who is completely blinded by the showmance is Tom. Idiot. I cannot wait to see the look on his face when he is blindsided Thursday. And hopefully Liza is out right after him. Go Gary! Go Gary! Go Gary! Your very welcome.. glad you like our spoilers.